National Concerts presents the U.S. premiere of Estonian composer and NC's composer-in-residence Tõnu Kõrvits’ Moorland Elegies. Dr. Gregory Fuller leads the University of Southern Mississippi Southern Chorale and Symphony Orchestra in this featured performance. Opening the concert, Dr. Brandon Williams will conduct The Voorhees Choir from Rutgers University in a dynamic program of music set to text by all-women titled, In Her Words. This major cross sector event will convene 200+ professionals and provide you with an afternoon of insights and networking, animated by five expert panel discussions, food tastings, an eco-fashion show and an Innovation Hub. Keynote Speaker Lise Kingo, CEO & Executive Director of United Nations Global Compact, will inaugurate the Forum and will be joined by a selection of stellar speakers, to explore how to build a more sustainable future. Speakers include top executives and experts in this field from Fairtrade America, Danone, L’Oréal, EDF, the former Deputy Mayor of Paris, Be Social Change and more. BACC Member - please apply code BINATIONALCHAMBERS and benefit from the member rate! Estonian folk singer Mari Kalkun presents a performance of unique compositions inspired by nature, Estonian poetry and folk music. She will perform an array of songs with lyrics written by Estonian poets intertwined with traditional singing (regilaul) and folklore, using the kannel, piano, accordion, guitar, and other instruments. “Kalkun’s singing is at the heart of things; joyous and lamenting by turns, but always poised and melodious, her poeticism apparent even without translation. A magical creation.”—The Guardian. Join us for the 19th Edition of the Spring Networking Event at the Central Park Boathouse with the collaboration of 18 European Chambers of Commerce. To enjoy food and drinks with the view of the Central Park and the water with 500+ guests belonging to the various European Binational Chambers of Commerce. This is a joint event of the European-American Chamber of Commerce in the United States, Inc., the largest transatlantic business network representing 18 bilateral European-American business organizations and a collective membership of more than 25,000 companies. The new conference on ideas, tech, and innovation at Met West NYC! From the founders of Europe’s premiere Mobile Marketing Innovation Days, comes Moving Forward, a conference celebrating innovation, thought-provoking conversations, and meaningful connections. Following it's inaugural 2017 and 2018 events in Vienna and New York City, Moving Forward will bring executives, tech founders, startups, creatives, and industry leaders together again in NYC on May 30, 2019 for a conference that will cover the most important tech, business, and cultural trends of our time. Artificial Intelligence, Blockchain & Cryptocurrency, Digital Tranformation, Design, Diversity, E-Health, FinTech, GreenTech, Media, Mobility, Social Media, Startups, Sustainability, and more! “Pitch & Mix” events are hosted by the European-American Chambers of Commerce in the U.S. (EACC) to celebrate the EU tech scene, as well as to connect the broad inter-country network in NYC. This networking night will feature some of the most innovative and cutting-edge European Sport Tech startups, enthusiasts, entrepreneurs and young professionals focused on sport technologies. Six of the hottest European sports tech startups will pitch and showcase their latest advances. Learn about how they are changing the sport landscape experience and the future of European innovation. Startup pitches will be followed by an audience vote and a networking reception with tech enthusiasts, entrepreneurs, and investors. It’s this time of the year again! The European American Chambers of Commerce (EACC) Fall Networking Boat Cruise is coming up on September 17, 2019. Join us and 350 professionals from all across Europe for a breathtaking sunset networking cruise on the Hudson River. Get your tickets now for this prime networking opportunity and enjoy a buffet dinner, an open bar andspectacular views while mingling with international executives. Details to be announced soon. Please feel free to email us if interested. At the 3rd annual USA-Europe Business Services Summit & Awards Gala, American companies will be distinguished for their operational excellence with Europe-based business services delivery centres. We expect more than 150 top executives from 75+ companies to attend. The full-day Summit is an integral part of the program - packed full of top US SSC executives disclosing lessons learned, case-studies, and operating insights. And our Digital track aims to connect US mid-market companies keen to tap into top Tech talent from Central Eastern Europe. Prepare for our upcoming tour of the Baltic States (Lithuania, Latvia and Estonia). Details to be announced soon. Please feel free to email us if interested. We are delighted to welcome the Lithuanian Trade Delegation consisting of 27 business professionals, one of the biggest recent years. The delegation spans sectors a broad swath of business sectors to include architecture, planning, design and constructions, production of water and air ionizers, plastic and glass products, machinery and metal processing services, food, bakery, restaurants, hotels, consulting services etc. We are cordially invite you to a Lithuanian National Foundation Inc. (Tautos Fondas) fundraiser! Concert to benefit Lithuanian orphans. Program: Simona Minns concert. After the concert, please join us for light snacks and wine. Entry Donation: $50, $100 or $150 per person. All donations are tax deductible. All donations will be sent to Lithuanian orphanages in poor areas. Funds will support the "Consolation" program to organize summer camps for the orphans. For those unable to attend and wanting to support the fund raising effort, please send your donation to: Lithuanian National Foundation Inc. (Tautos Fondas) 307 West 30th Street, New York, NY 10001-2703. Please R.S.V.P. by April 2nd to the following email: info@tautosfondas.org or call at 212-868-5860.
shining a spotlight on the inner-workings of the ecosystem behind one of Silicon Valley's best-kept secret "unicorn hatcheries". There will be more than 20 of the hottest Estonian startups and ecosystem-supporting organizations. Don’t miss an opportunity to meet the most advanced digital society in the world! In collaboration with the European-American Chamber of Commerce in the U.S. (EACC), we have the pleasure of inviting you to an exclusive evening where some of the most innovative and cutting-edge European startups will pitch their ideas, visions, and trends regarding Retail-Tech. Six of the hottest European real estate startups will pitch and showcase their latest advances. Learn about how they are changing the healthcare landscape experience and the future of European innovation. Startup pitches will be followed by an audience vote and a networking reception with tech enthusiasts, entrepreneurs, and investors. Join friends from over 20 countries for a networking night dedicated to celebrating some of Europe's best Real Estate | PropTech companies. This event will give you a prime networking opportunity, where you will enjoy delectable starters, a premium open bar and a cozy fireside ambiance in an Art Deco-inspired décor and unparalleled Central Park views, while mingling with international executives and other top professionals. 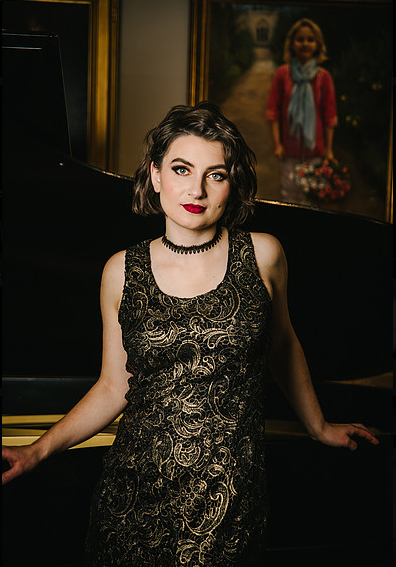 The evening’s jazz artist will be the silky-toned Lithuania-born singer and composer Simona Minns, recipient of the Berklee Outstanding Jazz Vocalist Award and the Boston Foundation Live Arts Grant Award. Enjoy live jazz and impressive NYC views at the luxury of JW Marriott Essex House New York with us and international business, political and cultural leaders! Buy Local, Think Global: International Experts Share Emerging Trends, New Technologies and Strategies to Drive Sales through Specialty Food Retail. The International Food Marketing Summit will provide attendees with an overview of emerging trends, new technologies and strategies to drives sales through specialty food retail. Attendees will delve into the day's "Buy Local, Think Global" theme with this year's inspiration - Italy. You will gain up-to-date insights about emerging and future trends, merchandising techniques, innovation, and customer engagement from an incredibly diverse slate of international food experts. Register today and learn from our line-up of industry experts how best to engage, activate, and retain your customers by thinking global. The Summit will be held by EACC member Italy - America Chamber of Commerce in partnership with Saint Joseph's University's Academy of Food Marketing. Baltic American Chamber of Commerce (BACC) is a member of EACC. All BACC members are eligible for a $100 discount off the regular ticket price ($ 299). Please use a discount code “ALUMNI”. Registration - BACC Members use a special EACC member code (“ALUMNI”) which provides a $100 discount off the regular ticket price. Get your discounted ticket here now! Celebrate the Latvian community with the Knicks! For the second straight season the Knicks will honor the Latvian community at Madison Square Garden. NBA All-Star Kristaps Porzingis will be integrated throughout the night in honor of his Latvian heritage. Also, come see Davis Bertans of the Spurs who is from Valmiera, Latvia. How do I know where to expand in Europe? Which country is better for me? Can I be pan-european from the start? We’ve scouted all over Europe to find the best startups in their fields that are scaling up in multiple countries, and are full of stories and lessons to share with you. Coming from diverse verticals, such as Blockchain, Travel Tech, Industrial IoT and Analytics, these startups have learn a lot about analysing the legal administrative, cultural and market complexities of new ecosystems. Each young company been selected as one of the top achieving startupstaking part in Startup Lighthouse, a Startup Europe project that in 2018 organised ‘Deep Dive Weeks’ to explore Berlin, Dublin, Lisbon and the Baltics. Scaling in Europe is hard work - but don't worry - you can talk with our startups and experts over some finger food and see if you're going to be the next one touring Europe with Startup Lighthouse! Startup Lighthouse illuminates the way for European scaleups, helping them to navigate the complexities of scaling abroad. Through their ‘Deep Dive Weeks’ to Berlin, Dublin, Lisbon and the Baltics, selected startups that are ready to scale across Europe are given a week of complete immersion in the new ecosystem. Could you be the next to join them? ATTEND SILICON VIKINGS STARTUP WORLD CUP BALTICS COMPETITION 2019! The 2019 National competition for the Baltic Region will be held at TechChill in Riga, Latvia. Consulate General of Estonia in New York is pleased to invite you to Classical Music Concert by Peep Lassmann and Endrik Üksvärav (Music by Estonian composers such as Arvo Pärt, Tõnu Kõrvits, Veljo Tormis among others). 2019 may be a year of significant political upheaval for Europe. While Brexit is one of the more notable upcoming transitions, the region will also have a new European Parliament and European Commission, as well as face a change in leadership across the EU’s institutions. This, amidst global adjustment to an uncertain and evolving transatlantic relationship. How will businesses—and the rest of the world—prepare for these shifts, as well the changing power dynamics within the multilateral sphere? Ambassador Joao Vale de Almeida, Permanent Representative of the European Union to the United Nations, joins us to share his insights. The Baltic American Chamber of Commerce (BACC) invites You to our EACC partner’s event focused on the impact of cyber threats to businesses and government in collaboration with the New York County District Attorney's Office. The panel of experts will be focusing on today's cyberscape for small, medium, and large-scale organizations (including governments, businesses, and non-profit entities) and will also touch on major recent cyber attacks and breaches in the news and what can be done to prevent future attacks. The presentation and panel discussion will be followed by Q&A’s from the audience. The moderator of the event - Kenn Kern, New York County District Attorney’s Office. Blockchain Centre Vilnius is celebrating its first anniversary on January 23, 2019. On this occasion the Centre is organizing a conference, “One Year Anniversary Conference”. The conference will be broadcasted live on Blockchain Centre Vilnius Facebook page. Among high level speakers from the European Commission, Lithuanian Government, Lithuanian Central Bank, ODEM.IO , Debitum Network, Pillar Foundation and other tech companies, you will meet WTO Chief Analyst Emmanuelle Ganne who will make a keynote speech on how blockchain can revolutionize international trade. Take a look at the AGENDA. We are delighted to invite you to visit a contemporary art installation GARDENS by renowned Lithuanian-American artist Ray Bartkus in one of the most spectacular places in New York – Federal Hall National Memorial. The installation will be on display from Monday, December 17, 2018 till Friday, January 4, 2019.
from 5:30 p.m. to 7:00 p.m.
Ray Bartkus is a conceptual Lithuanian-American artist whose large-scale installations, paintings and illustrations, many dealing with today’s complex political, economical and social realities, have been exhibited and published around the world. R.Bartkus has displayed his personal work in several exhibitions and festivals in the United States and Europe. His works have been acquired by the National Portrait Gallery (United States) and the Lithuanian Museum of Art. R. Bartkus has illustrated for a number of publications, including the New York Times Book Review, Harper's Magazine, the Wall Street Journal and Time magazine. Mettis Quartet and pianist Gabrielius Alekna perform a compelling program showcasing Lithuanian modern classics, including String Quartet in C Minor by Mikalojus Konstantinas Čiurlionis, a towering influence on the country’s professional traditions in both music and visual arts along with MiKonst for piano and strings by Remigijus Merkelys, inspired by and alluding to Čiurlionis. Philip Glass’ String Quartet No.2 (“Company”) and Robert Schumann’s Romantic masterpiece Piano Quintet in E-flat Major will complete the program. Presented in collaboration with the Consulate General of the Republic of Lithuania celebrating the Centennial of the restored Lithuania and its partnership with the United States. 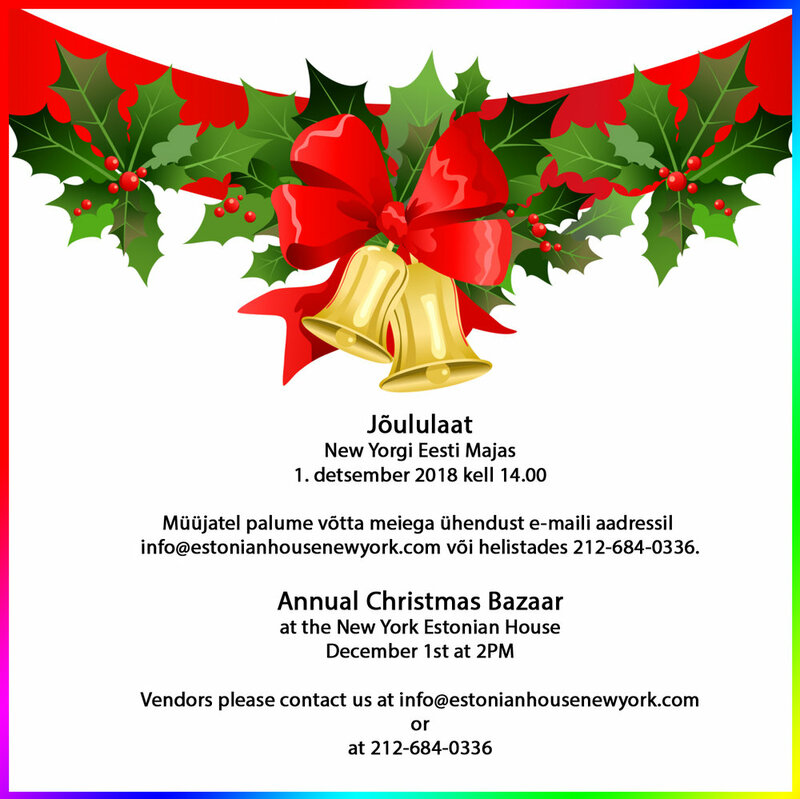 Discover the Baltic States’ Christmas traditions at the Christmas Bazaar, the New York Estonian House. You can buy, you can sell or just come and feel the Baltic States’ Christmas Spirit. VENDORS: please reserve your spot at info@estonianhousenewyork.com by November 27, 2018. For further enquiries ask here. Feel the Baltic States’ Christmas Spirit! Festively decorated market stalls will offer traditional handcrafted goods, elaborate Christmas decorations and culinary delights. Downtown Voices; Stephen Sands, Conductor. Concert attendees are invited to attend a reception with light refreshments in St. Paul's Chapel after the performance. The reception is supported by the Estonian Consulate General in New York. We are delighted to welcome Estonian Government Representatives and IT Companies from Estonia, the most digitally advanced society in the world, for an exclusive discussion. The Estonian IT sector and ambitious startup community dare to create innovative e-services that change the world – from Skype to e-Residency. Estonia is one of the top countries that has the most startups per capita established than anywhere else in Europe. Read more here. Attendance Fees: By invitation Only. Join us and our EACC’s (European-American Chamber of Commerce in the US) partners for the YEX Charity Aperitivo at the Scavolini Soho Showroom. Members of the Young Executives of the Italy-America Chamber of Commerce and the Young Professionals of British American Business will come together to network and support an amazing cause spearheaded by COOPI, an independent humanitarian NGO, with the mission to support communities for recovery and long-lasting development in the most vulnerable contexts, providing food, education, health and protection to thousands of children in 8 countries. The evening will feature an open bar and food prepared by the Association of Italian Chefs in New York. All proceeds will be donated to COOPI. Tickets are $45, and includes food by AICNY & open bar. November 20, 2018 at 6:00pm - 8:00pm. Partner Event: Learning Session - Can The EU Save The WTO? The current political landscape is having a major impact on international trade. The European market is faced with an ever-changing context affecting the import of its products (e.g. steel, cars) to foreign markets. In an attempt to guarantee international trade, the EU has recently proposed a set of new rules with the hopes of invigorating the World Trade Organization. Are you unclear about these rules and their impact, or are you skeptical with regard to their effects? Either way, come and join us for a session with Prof. Dr. Jan Wouters, expert in international law and international organizations at KU Leuven and Columbia University. Limited seating, RSVP required. The annual Sustainology Summit 2018 brings together some of Stockholm's and New York's most disruptive entrepreneurs, investors, decision-makers, and innovative startups to focus on the United Nation's Sustainable Development Goal #17: Partnership for sustainable development. The theme of this year is Food Tech. Innovation. The summit feature the latest products and innovations within the food industry from both established companies, as well as startups, inviting opportunities for cross pollination between the public and private sector. The program includes panel discussions, start-up pitches and shorter presentations; and follow with various breakout sessions, which offers participants the opportunity to engage in more in-depth and interactive discussions. The day will finish with a cocktail reception. EACC - the European American Chambers of Commerce in the United States - represents the greatest number of bilateral European–American business organizations located in New York. Together, their members build a strong network of over 25,000 companies that are collectively responsible for the overwhelming majority of business flows between Europe and the U.S. The Baltic American Chamber of Commerce (BACC) is a member of EACC. More about EACC here. We are delighted to welcome the Lithuanian Trade Delegation and 15 Real Estate business professionals for an exclusive discussion. These Real Estate professionals belong to the Lithuanian Real Estate Development Association (LNTPA). The LNTPA unites major real estate developers, assessors, and other companies operating in the real estate market. Together with our partners at the European-American Chambers of Commerce in the United States (EACC), we are delighted to welcome the European Permanent Representatives to the United Nations.